My essay entitled “All Our Relations” is one of two non-fiction essays in the Bellevue Literary Review issue devoted to Our Fragile Environment. 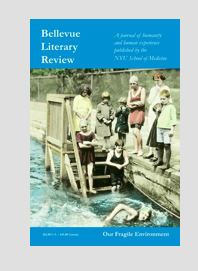 The issue contains pithy prose, fascinating poetry, and a number of stories one wouldn’t ordinarily find in a journal published by a medical school (!!). You can order your copy here.